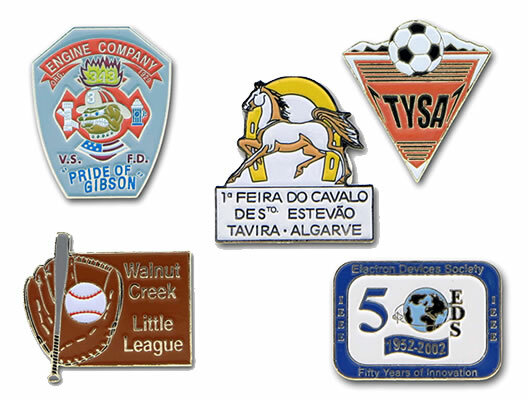 Fine Casted (lead-free) Promotional Iron Pins are perfect for large orders. Each Promotion Iron Pin’s design is stamped into iron and plated in gold 24kt gold, silver or black nickel. An epoxy dome can be added for a nice finished look. Extra durability. A clear epoxy coating can be added at your request if you desire to protect the enamel colors. Plated into fine metals: Promotional pins can be plated in 22K gold, silver, or black nickel. Stamped into an iron based metal blank. Pins are made with a standard die striking method. Large selection of soft enamel colors: Your pins are hand filled with any of our soft enamel colors, up to four colors if you so desire.